For an enterprise, to have a good online presence, having an attractive and professional-looking website is one of the essential requirements – It boosts the credibility and online image of the enterprise. Living in 2018 has made us experience incredible technological advancements that are providing user friendly experiences across the digital platforms. However, few among the most are aware about how colossal this effect actually is. So, how do you evaluate your corporate website? What are the parameters that help you analyze the gaps on your website. Read on. Before we go on to the key aspects of analyzing a website, let’s look into some statistics that are an eye opener for everyone and should be taken seriously. For a user, it takes 0.05 seconds to form an opinion about your website. 85% of adults think that the mobile version of the website should be more attractive than the desktop version. If the content layout is unattractive, 38% of the users will stop engaging on the website. 47% of users expect a maximum of 2 seconds loading time. 75% of consumers’ admit that they judge a company’s credibility based on its website design. From these statistics you can understand that a corporate website also plays a significant role in building and shaping your company’s online brand image. Now let’s look at the parameters that will help you to review your website and identify the gaps. The backbone of a good corporate website is a precise strategy that is in-sync with company’s goals. Ask yourself, are the new visitors getting a clear sense of your website and your offerings? Are the users able to find the information easily and are they able to navigate to the right sections with ease. If anything makes you feel dicey it’s time to re-think about your design and its effectiveness. Define the category of your business and is it obvious on your website? What is the purpose of your website and is the design accomplishing the purpose? Who is your target audience and how is the design taking it into consideration? What will your audience do while visiting the website and is the design encouraging that action? User Experience is one of the most important aspects of a website that needs serious focus – factors that affect UX include usability/accessibility, security, technicalities etc. Is the search button visible to the visitors? Are all the links working on the website? Is the website responsive on different browsers and devices? Are your customers/clients details secure on your website? Does your website’s color, look and feel and graphics are in-sync with your branding goals? Do they match with your marketing collateral? Is the style consistent throughout your website? Is the style suitable for your target audience? is the look and feel of your website better than your competitors’ website? Are any images or design elements getting in the way of conveying the message? There are 2 main deliberations regarding content- Readability & Usefulness. Readability comprises understanding, text size and text color. If the visitor cannot comprehend your message then there’s no use of the content. Similarly, usefulness is just as important, however if your content doesn’t matter to your reader, you’ve already lost the visitor. Ask yourself these questions while evaluating the quality of your content. Are the fonts you’ve chosen easily readable? Does the contrast between background colors and font colors enough for the readers to read it easily? Are all the texts big enough? Is the content relevant for the readers? If your content is short and crisp, is it still conveying your message? Is the design complementing the content? According to the Search Engine Journal, “SEO and social networking all starts with a strong website design.” Undoubtedly there are many way through which the design of your website impacts the search optimization. If your website is filled with graphics but search engines cannot find them, then your website is not search-engine friendly. You need to add ALT Tags to your images in order to let search engines know that they are images. Are all the images on your website optimized with ALT tags? Is the HTML coding efficient or are there any irrelevant codes that can be removed or optimized? Is your website incorporated with the right keywords and content? There was a time when artificial intelligence was only a matter of sci-fi. But now, AI has already worked its way through the prevailing web designs via conversational interfaces like chat bots. Moreover, we’ve been already using AI in our day-to-day work like without knowing it! Your Google Assistant and Apple’s Siri are what are called Artificial Narrow Intelligence which is solving our day-to-day problems. However, are you using AI to ease the visitors’ experience on your website? Yes, you can. Is there a need of installing a Chat bot on your website? Can chat bot improvise the user experience on your website? Its official, Mobile web browsing has surpassed desktop browsing because of the obvious reasons. Now that majority of the users opt for browsing and shopping online through their smartphones. Web designers are now following the concept of progressive enhancement where only the important design elements are kept at the heart of the UX and then additional features are added as the screen size increases. Is your website design responsive for all screen sizes? Is your design appealing for small screen size? Are the entire offload tasks optimized with alternatives? Analytics website metrics can be a challenging work; you should take the help of your digital team or digital marketing agency. A website’s success varies from business to business and its goals, though one can measure the performance of their website by using analytics and the factors that one measures with these analytics are called metrics. As per Content Marketing Institute, there are 4 categories in which all the metrics fall- Sharing, Consumption, Sales and Lead Generation Sales. Keeping an eye on these metrics is a good practice to observe your website’s performance. Sharing Metrics- As the name suggests, these metrics analyse the number of share of your content across the web. 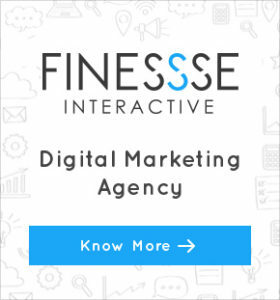 These metrics include: – Social signals, backlinks and Email open rate and forwards. Consumption Metrics- It refers to the content visible to your visitors and when they consume it while visiting. These metrics include:- Page views, video views, document views and number of downloads (only on downloadable content). Sales Metrics- This is an important metric for websites that sell products online… You should be able to analyze and find out if the CTA (Call to action) buttons are at the right places, if the navigations are in place, if the landing pages are optimized for sales, if the cart pages working without any issue and so on. While website’s sales panel and analytics can help you track sales, analytics tool can also help you to study the user behavior and how it’s affecting sales. Other tools like A/B testing, heat map tools etc. are also used to study user behavior. Lead Generation- for a B2B business, Lead generation is an important goal. The metrics include Conversion rate, form completions and call-to-action downloads and blog subscriptions. 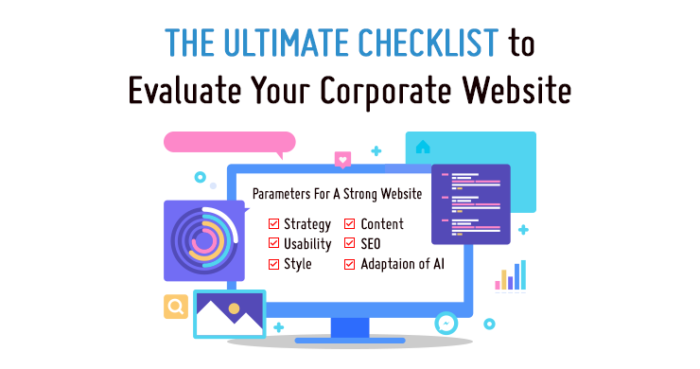 While the above mentioned parameters will help you to evaluate your corporate website effectively, use can use this quick guide of Do’s and Don’ts for reference. Don’t fill the page with long paragraphs unnecessarily. Create content which can be scanned.